who the people behind Speed Kit are. To accelerate content delivery, Speed Kit intercepts requests made by the browser and reroutes them: Instead of loading content from your original Plesk website, the browser fetches data from Speed Kit's superfast caching infrastructure. The following schematic illustrates this procedure. Whenever a user is visiting a your website, Speed Kit launches a Service Worker, a process running concurrently to the main thread of execution in your browser. This Service Worker intercepts and reroutes browser requests according to speedup policies (whitelist, blacklist, etc.) that you can define: Speed Kit thus makes sure that your users get the cached, accelerated copy instead of fetching content from the original slower source. To avoid stale data, we purge outdated copies of your content in our caches. Behind the curtains, we use machine learning to identify those copies as fast as possible. But you can also use Speed Kit's refresh API to refresh your content periodically (default), manually, or programmatically by calling special API endpoints. If you do not have a vacant Speed Kit license, you will be asked to upgrade your plan. If your website is not secured with SSL, you will be guided through the process of setting it up. If both these requirements are satisfied, Speed Kit will be switched on and the button will change its label to "Configure Speed Kit". As long as Speed Kit is active for your website, clicking the button will lead you to the config panel where you can optimize Speed Kit for your website. If your website is a WordPress website, the Speed Kit WordPress Plugin will be installed in your word press installation: Speed Kit is already making your faster and you do not have to configure anything. However, you can do so any time by clicking on the "Configure Speed Kit" button. If you have a non-WordPress website, you need to click on the "Configure Speed Kit" button once again to enter the Speed Kit Dashboard. Here, you will be guided through the process of setting Speed Kit up for your website. In more detail, you will be asked to do the following: 1. Include a code snippet into your website (the Speed Kit Service Worker). 2. Define speed up policies to tell Speed Kit which requests to accelerate and which requests to leave alone. 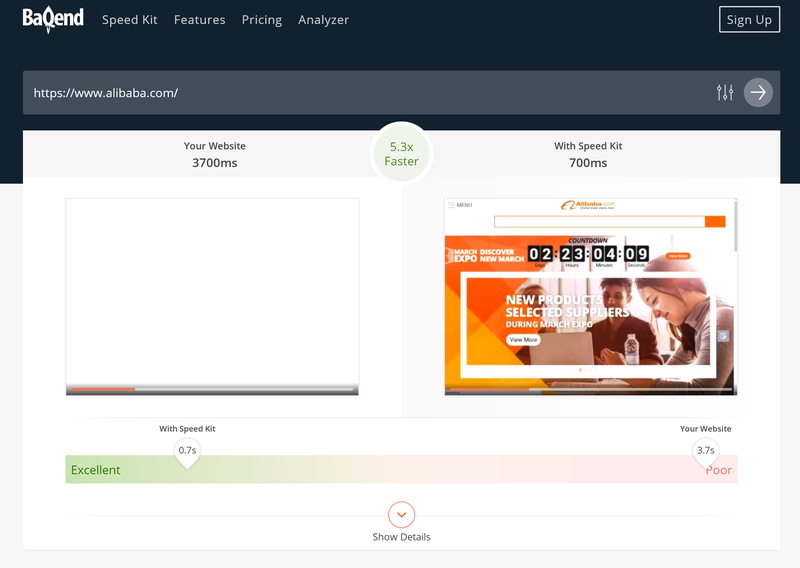 The Page Speed Analyzer is a testing tool that gives you an impression of how Baqend Speed Kit influences the performance of your website: It always compares baseline performance without Speed Kit (left) against the same website accelerated by Speed Kit (right). To this end, the analyzer runs a series of tests against your website and against an accelerated version; finally, it reports how much of an edge Speed Kit would give you over your current tech stack. Speed Index & First Meaningful Paint: Represent how quickly the page rendered the user-visible content. Baqend develops a cloud service that uses innovative caching algorithms to minimize loading times of websites. Publishers, shops, startups, and SMEs all face the challenge of competing with giants such as Amazon, Facebook, and Google. Baqend provides them with a technical platform to not only catch up with the market leaders, but to turn page speed into their competitive advantage. Baqend is based in Hamburg, Germany.